Mikhail Youzhny withstood a barrage of 33 aces to topple American giant John Isner 6-4, 6-7, 7-6, 6-4 on Sunday and reach the fourth round of the U.S. Open at Flushing Meadows. "He served well, but I have a lot of chances to break him," said the 12th-seeded Russian, who cashed in four of 12 break point opportunities against the erratic Isner. Youzhny dropped the second-set tiebreaker 9-7 and lost his first two serves in the next decider before battling back to win three points in a row from 4-3 down and claiming the set with his fourth ace of the match. The 6-foot, 9-inch (2.06 m) Isner is best known for his record-breaking marathon at this year's Wimbledon, where he prevailed 70-68 in the fifth set against Nicolas Mahut in a first-round marathon that was the longest tennis match ever. The 28-year-old Youzhny made sure there would be no fifth set at the National Tennis Center by breaking Isner in the third game of the fourth set and serving it out, finishing the three-hour, 18-minute tilt with a forehand volley. "He's mentally tough," said Isner. "He just stayed steady and just outplayed me a little bit." "He kind of sees my serve pretty well, a lot better than 99 percent of the players out there. So he was able to get a lot of balls back," added Isner, who contributed to his own downfall with 61 unforced errors. Isner's defeat left 20th seed Sam Querrey as the last U.S. man standing. The lure of winning another grand slam title is proving irresistible to Kim Clijsters and retirement is suddenly the last thing on her mind. But the Belgian, who returned to the sport last year after dropping out to start a family, says her future in the sport hinges on whether she can remain competitive at the highest level. She admits she might have already thrown in the towell if she did not win last year's U.S. Open but her stunning success at Flushing Meadows has given her the confidence to play on. "I decided to come back because I obviously wanted to try and get back to the level that I used to play," Clijsters told a news conference after thrashing Ana Ivanovic 6-2, 6-1 on Sunday. "I wouldn't have been satisfied being ranked in the top 20 and playing tournaments here and there and not competing for titles. "I don't know if I would have still been going if I felt like maybe physically I couldn't handle it or if just tennis-wise I wasn't able to produce the same kind of level." Second time around, Clijsters is enjoying her tennis more than ever and, judging by her performance against Ivanovic, she is playing as well as ever. Rafa Nadal sent an ominous warning to his rivals about his intentions to win the U.S. Open and complete his collection of grand slam titles with another impressive straight-sets win on Sunday. The Spanish world number one, getting better with each match on the back of a new and improved serve, overpowered France's Gilles Simon 6-4, 6-4, 6-2 to steam into the fourth round without dropping a service game in three matches. "It was important not to lose without dropping a set," Nadal said. "Every day I seem to play much better which is good for my confidence." Spain are already assured of at least one men's semi-finalist after Fernando Verdasco, David Ferrer and Felciano Lopez joined their countryman Nadal in the same section of the draw. 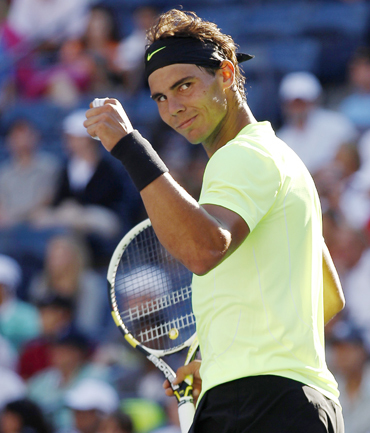 Nadal will face Lopez next with the winner to play either Ferrer or Verdasco. A fifth Spaniard, Albert Montanes, is already through to the last 16 on the bottom half of the draw. Two-time U.S. Open champion Venus Williams is still feeling young despite her senior status on the women's tour. Williams booked a quarter-final meeting with the only other 30-year-old left in the Open draw, Italy's Francesca Schiavone, with a 7-6, 6-3 victory over Shahar Peer, of Israel, on Sunday. Williams, who turned professional when Peer was just seven, might be feeling her years in her legs - tendinitis in both knees has seen her pull out of three tournaments this season - but mentally she insists she feels as youthful as ever. "I don't even know how I feel, well, still young I would say," she said. "Still young, especially in the head, really young in the head." Williams, who blew the candles out on her birthday cake back in June, is in the twilight of her career. Although only Chris Evert and Martina Navratilova have consistently dominated the grand slams in the third decade of their lives, Williams is not concerned. "It seems like everybody is hitting their stride at 30 - it's the new 20," she said with a smile. Her quip is not so fanciful when you consider that Schiavone reached her peak as a player just a few days shy of her 30th birthday with victory at this year's French Open. But Williams' body is feeling the strain of a 51st grand slam and it is worth noting that she celebrated the last of her seven grand slam titles more than two years ago. Despite the record books, the former world number one believes she could yet add a third U.S. Open to the titles won in 2000 and 2001. "When the tournament started, it was little uncertain how I would hit the ball in a match," Williams said of her battle with tendinitis. "I haven't played as much as the other players but I'm still getting the win so that's what's important. "It's very exciting to be here and hitting well and getting the games on my side so that's what I want to continue. Anything's possible." When Williams has played she has tended to win. She has the best win-loss percentage - 86 percent - of any player on the tour aside from her younger sister Serena, who is sitting out Flushing Meadows with a foot injury. Venus, who has banked more than $25 million during her illustrious clear, knows she needs to raise her game to make it to Saturday's final. Stanislas Wawrinka beat an ailing Andy Murray 6-7, 7-6, 6-3, 6-3 in the third round of the U.S. Open on Sunday. The fourth-seeded Scot served for a two sets to love lead but then suffered a left thigh problem and Wawrinka, who also had treatment for a thigh injury, recovered to win after three hours 56 minutes. The defeat handed Murray his earliest defeat at a grand slam event since he was beaten at the same stage in the French Open in 2008. Murray, the runner-up in New York in 2008 and also at the Australian Open this year, began slowly but bounced back from 5-2 down to win the first set on a tie-break. The Scot stormed to a 3-0 lead in the second set and though he was broken in the fifth game, he then broke Wawrinka again to lead 5-3. At 5-4 and 30-30 on his own serve, he was two points from taking a two-set lead but Wawrinka became more aggressive and after breaking back, ultimately snatched the tie-break 7-4 to level the match. Murray then broke in the opening game of the third set but immediately dropped his serve and in the next game, it seemed that he was struggling with his movement, especially to his left. Murray's service speed also dropped and Wawrinka then broke again in the fourth game on his way to a 4-1 lead, before Murray had treatment on his left thigh. The Swiss then pulled up in the next game and had to have his right thigh strapped but still it was Murray who was struggling the most and Wawrinka held on to take the set. The pair traded breaks at the start of the fourth set but Wawrinka broke again in the fifth game and though Murray saved one match point, a forehand long handed the Swiss another break and the match. "I just tried to focus on being really aggressive," an elated Wawrinka said. 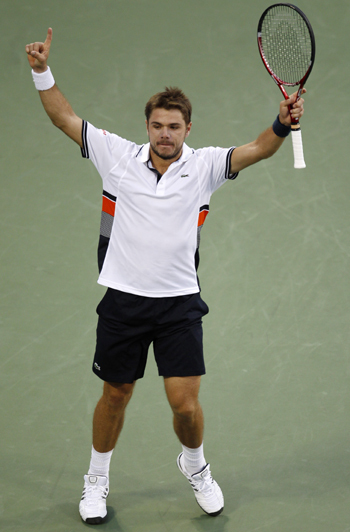 Wawrinka will play American 20th seed Sam Querrey in the fourth round.